I am particularly pleased to confer to my friend, highly esteemed Heydar Aliyevich, today the highest state award of Ukraine - the “Prince Yaroslav Mudri” Order. The Order contains the words “Wisdom, Honor, Glory”. Highly esteemed Heydar Aliyevich, these words can be fully conferred to You. As a head of state, You demonstrate wisdom in solution of the political and economic questions, international problems of Your country. You have glorified Azerbaijan that holds a worthy place in the South Caucasus, in Europe and world. I would especially notice Your contributions to strengthening of the Ukraine-Azerbaijan relations. A number of foreign leaders, including from Spain, Finland, Argentine, Brazil, and China were awarded with “Prince Yaroslav Mudri” Order. I am pleased that President of Azerbaijan is among of them. This evidences our country’s respect and honor for the President of Azerbaijan and the people of Azerbaijan”. … On my deep belief, process of revival of your state, becoming a democratic society and deep economic transformations would be inconceivable without your self-sacrificing activity as an outstanding statesman and politician, the person, whose spirit and flesh is from the spirit and flesh of the Azerbaijani people. Results of the elections in your country became bright confirmation that the people of Azerbaijan trusts in your wisdom and sees in your image of the head, which confidently conducts Azerbaijan to prosperity and well being. Due to your efforts, the world community with deep respect concerns to your country and by the right counts it the stronghold of peace and stability in the region. It is sincerely glad, that in your person Ukraine has found a close and reliable friend. 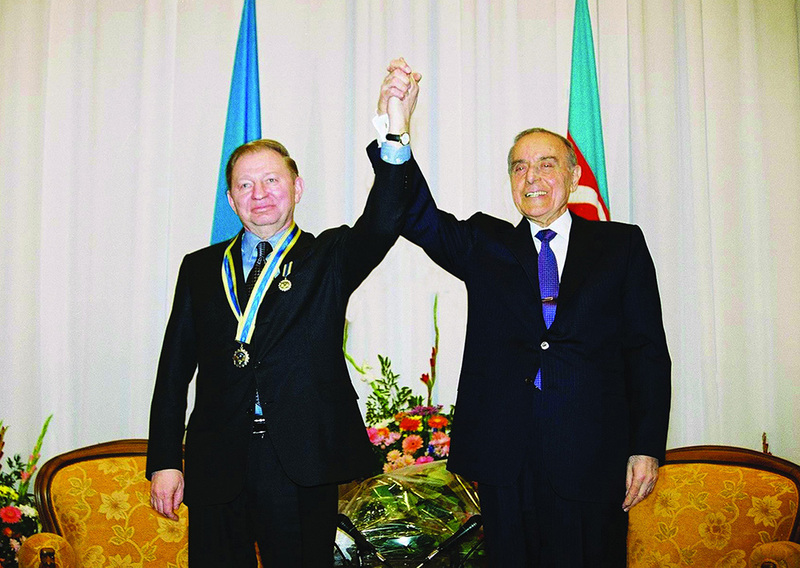 The irreplaceable leader of Azerbaijan Heydar Aliyev was my close friend and the friend of Ukrainian people. Our friendly attitudes developed and became stronger due to him. Heydar Aliyev was the ingenious person, the wise person. It is confident that the Azerbaijani people will further realize Heydar Aliyev’s greatness even more deeply.